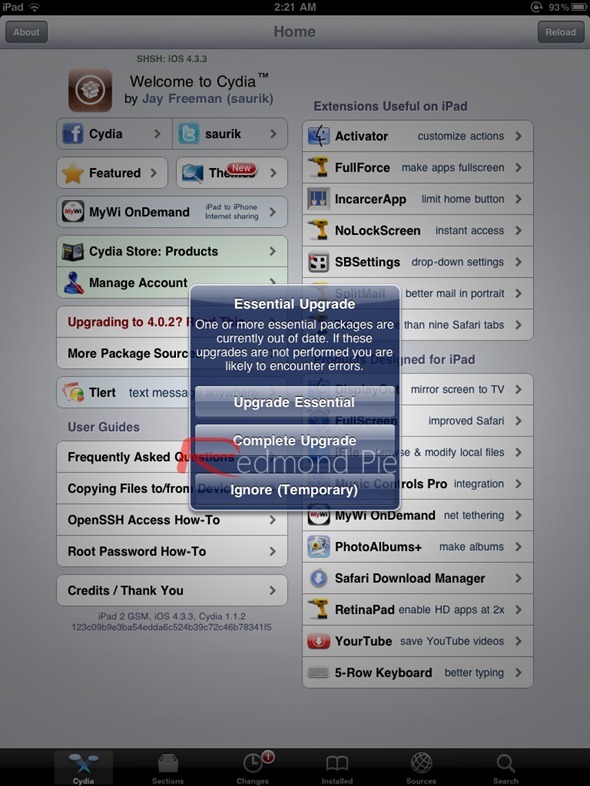 JailbreakMe 3.0 iOS 4.3.3 Bugs Fixed Via Cydia "Essential Upgrade", Update Now! JailbreakMe 3.0 has received an "essential upgrade" via Cydia today, allegedly fixing previous issues that caused Apple’s Camera Connection Kit accessory, BiteSMS, and sometimes Cydia (disappearing problem) to stop working altogether. Every iOS user who has jailbroken their device with JailbreakMe 3.0 is encouraged to apply this update via Cydia as soon as possible. We haven’t tested whether Apple’s Camera Connector Kit accessory is working with this update yet. So if you have tried it and it has worked, do let us know. For those who are not aware, the Camera Connector is a hardware add-on available exclusively for the iPad that lets users transfer images from their digital camera or SD card to the iPad’s built-in picture library. The accessory, which plugs right into the iPad’s dock connector, is available for $29 right off from Apple’s Online Store. JailbreakMe 3.0, which was officially released less than a week ago, was reported to have been used 1 million times within 1 day after being released, before reaching as many as 2 million jailbreaks over the weekend. These estimates aren’t even counting the jailbreaks that were applied using an unofficial pre-release version which leaked several days earlier. This jailbreaking method has stood out from all others since it’s the easiest way to apply a jailbreak on any iOS device and is the first untethered jailbreak for the iPad 2, a device that many iPhone developers had been trying to hack into for months before JailbreakMe 3.0 came out. Jailbreaking a device using JailbreakMe 3.0 is so easy that a 5-year-old could do it: all a user needs to do is to point Mobile Safari to JailbreakMe.com and follow the on-screen instructions which include downloading a crafted PDF file that will patch the system and load Cydia onto it. There’s no computer required. You can learn in more detail how to apply this jailbreak from our write-up. The Safari vulnerability that allows this to happen is reportedly already being fixed by Apple, with the next point release of iOS 4.x, known as iOS 4.3.4. Users are warned to stay away from this release if they have or are planning to jailbreak their devices using JailbreakMe. Instead, users should perform the jailbreak, if they haven’t already, and install PDF Patcher 2 from Cydia in order to fix this nasty vulnerability while still preserving all the benefits of owning a jailbroken device. If you haven’t already, please install this "essential upgrade" from Cydia. UPDATE 1: We have got the confirmation from our readers on Facebook that both Apple’s Camera Connector Kit accessory and BiteSMS are working fine after this update.